Thanks so much to everyone who commented and entered! Thanks for the enthusiasm and feedback! Love your projects!!! 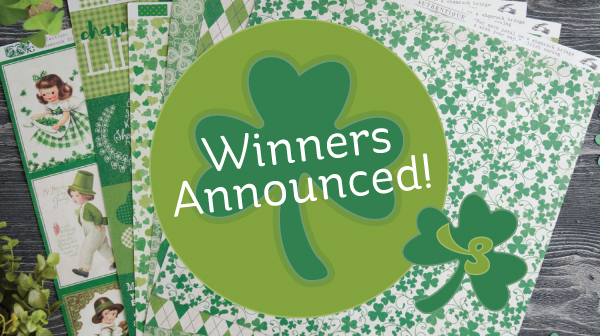 Out of almost 200 entries, the winner of the Authentique Shamrock Paper Collection and the $25 SVGCuts gift certificate is Misty Morgan! Congrats, Misty!! Please Contact Us to claim your prize! Additionally, fans who entered at least one photo of their Saint Patrick's Day themed SVGCuts project have each won a $5 SVGCuts gift certificate! Congrats, Jennifer Gough Mabrey, Lisa Conner, Angela Collins, Jena Reynolds, Maria A Molenaar, Lee Cox, Kris Peterson, Joyce Milgore, Shannon Bexon, Dotti Jean, Nancy Turnbaugh, Maryann Howell, Donna Sportbert and Donna Abbott Bradford. Yahoo! Please Contact Us to claim your prize! Check out some of the fantastic fan photos that were shared! Leprechauns don't stand a chance when they climb these ladders, go for the gold coin and then fall to the bottom of the box! Love how adorable and unique each take on the Gold Coin Inn Leprechan Trap is! Shannon, Joyce and Lisa's Lucky Clovers Box Cards are so pretty! Perfect for welcoming a bit of green after a long winter! This card is from the Springtime Box Cards SVG Kit. Love these versions of the Beer Mug, Pot O' Gold and Shamrock Box from the Feeling Lucky SVG Kit! Nancy and Lee used the Leprechaun design from this Kit at an enlarged size to make decor! P.S. The Lucky Day Bags and Boxes SVG Kit was updated recently for optimized cutting. If you've purchased it prior to the update on 1/29/18, you can Contact Us for your free upgrade. Please include your Order Number if possible. Loving Joyce and Kris' pretty versions of our free Celtic Card (get yours in the Free Designs section of our blog here)! Fans put a Saint Patrick's Day spin on projects that initially had a different theme in our store. Too cool! What a cute twist on the Top Hat Box from the New Year's Eve SVG Kit! Cheers to this cute twist on the Six Pack Box Card from the Sunday with Dad SVG Kit. How cute is Lisa's Hot Air Balloon project from the High Skies SVG Kit?! Love Maria's project using the 3D Letters SVG Kit! How cute is Donna's Six Pack Box Card from the Sunday with Dad SVG Kit? Check out what Nancy made using the bag from the B is For Birthday SVG Kit! Thanks again to everyone who entered! 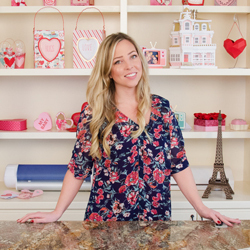 I LOVE seeing your projects, and thank you for giving me something fun and inspiring to share! I'm hard at work on a rustic/western/cowboy set of ideas, and can't wait to share! Check out our New Kit Tracker for a sneak peek of the new Rustic Lantern! You can follow the @SVGCutsTracker on Twitter for the latest scoop, and follow us on Facebook to enter another Paper Giveaway soon! Have a great week!